Many people prefer a smaller home. Perhaps they have no children, want smaller home expenses, live in a more urban setting, or are empty nesters who are downsizing their home. However, a smaller home often mean limited bathroom space. Modular construction in Williamsburg, VA is the right solution for increasing bathroom space. In modular homes small space doesn't come into play in regards to the bathroom area. Modular building systems can layout a stylish and fully functional modular bathroom even with limited space. When browsing the modular bathroom gallery, there are ideas on how fixtures and other elements can be strategically placed for maximum use of space. These better alternatives are possible with smart software that is utilized by modular manufacturers in designing the interior layout of the house, including the bathroom. When a homeowner builds a smaller home, they need to more closely consider the bathroom arrangement. With the Modular building system there is a way to address this. There are limitless options for arranging a smaller bathroom including a double vanity or large mounted cabinet in place of a bathtub. There can also be an enclosed shower to separate that area from the toilet and sink. These are just few smart options for making your bathroom organized and stylish even with less space. Contact Tidewater Custom Modular Homes to find out more about the options for designing your bathroom space. Today, many people are concerned about the environment and greener living. This is often a top consideration for homebuyers who want a greener, more efficient home. However, most homebuyers who are opting to build a home for themselves don't know of the green advantages in choosing the modular building system. Modular construction in Suffolk, VA creates and builds homes with reduced construction waste. Many modular builders are also now using sustainable materials to scale down the carbon footprint of every home. When choosing a home builder, one way to ensure these builders are using greener technologies is to look for the "Green Seal Certified" logo on their website or portfolio. The Green Seal™ is awarded to excellent products that have minimal impact on the environment. To earn the seal, a product must comply to environmental standards by undergoing stringent evaluation and testing. Green Seal™ standards are predetermined to recognize the most environmentally preferable products currently available in the market. Tidewater Custom Modular Homes is Green Seal Certified. We make sure our construction process produces homes with less construction waste. Less waste also leads to lower construction costs. Furthermore, Green Seal™ standard homes are energy efficient homes. This means that our modular homes have superior home insulation, windows, doors, and building materials. All of this means lower monthly energy expenditure and a smaller carbon footprint. Contact Tidewater Custom Modular Homes to find out more about the green features of our modular homes. Homebuyers with large families often prefer two story homes over single story. This is often because of the the thought that they may be able to save on construction costs for more space. However, if one dives deeper into details, they can see the many advantages in ranch style modular homes. Although, it is true that two-story homes can cost less in regards to the foundation and roofing costs. However, two story home require a secondary or larger cooling and heating system for the second floor which is an additional cost for purchase and maintenance. Meanwhile, ranch style modular floor plans only require one central HVAC system for the entire house. Going further, no space is used for building a staircase. Instead, that area can be used for functional space. In terms of safety, ranch style modular homes offer safer and convenient access for children and aging parents. It is highly recommended for homebuyers to study the design options of numerous types of homes before the design stage begins. It is important to take into account the specific needs of each member of the household. From there, it is easier to see and decide upon the homes style that can meet your specific needs. Contact Tidewater Custom Modular Homes for assistance on determining the home design to best fit your family and lifestyle. If you have limited lot space, a two-story modular home style is the perfect design to maximize the available area. Modular construction methods even broadens its scope by modifying traditional two-story modular floor plans into a more modern design such as the Henderson two story modular home. This improved design makes it possible to fully design the house with all the features needed even it is located on a small lot. 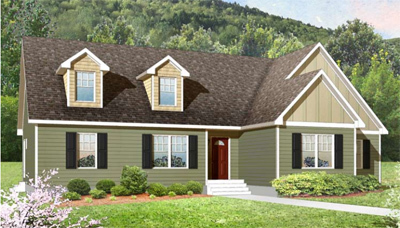 The Henderson two-story modular home optimizes the indoor space to accommodate three bedrooms. With the advanced technology used in modular construction, the interior is strategically transformed to make spacious bedrooms in the upper level. In the Henderson style, one room is larger than the other two rooms, creating a master. The master's bedroom has an attached bathroom while the other two bedrooms share a common bath. When you see the actual floorplan, you'll be amazed on how smart the layout is. Since all the bedrooms are upstairs, the living room on the main floor is very spacious, as is the kitchen and dining area. Homeowners can further customize the design for a more personalized layout to accommodate their daily routine. Moreover, modular construction make it possible to add a porch which contributes to the aesthetics of the home. To find out more about the Henderson Two-Story Modular Home, contact Tidewater Custom Modular Homes.